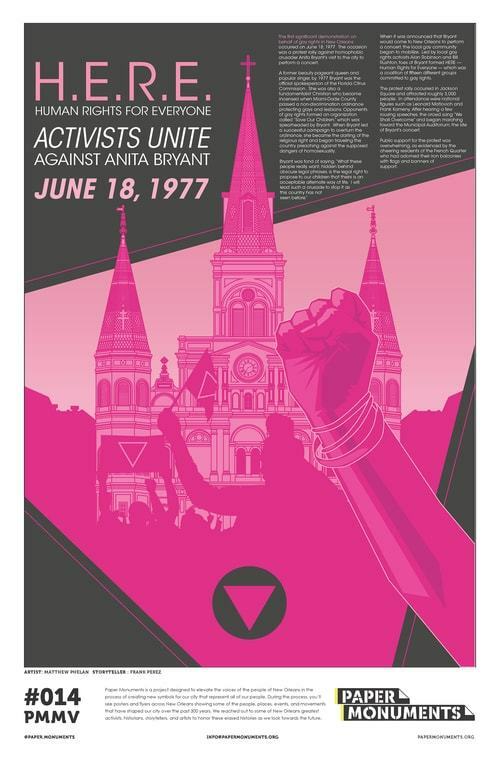 Paper Monument Project #014: The first significant demonstration on behalf of gay rights in New Orleans occurred on June 18, 1977. The occasion was a protest rally against homophobic crusader Anita Bryant’s visit to the city to perform a concert. A former beauty pageant queen and popular singer, by 1977 Bryant was the official spokesperson of the Florida Citrus Commission. She was also a fundamentalist Christian who became incensed when Miami-Dade County passed a non-discrimination ordinance protecting gays and lesbians. Opponents of gay rights formed an organization called “Save Our Children,” which was spearheaded by Bryant. When Bryant led a successful campaign to overturn the ordinance, she became the darling of the religious right and began traveling the country preaching against the supposed dangers of homosexuality. When it was announced that Bryant would come to New Orleans to perform a concert, the local gay community began to mobilize. Led by local gay rights activists Alan Robinson and Bill Rushton, foes of Bryant formed HERE—Human Rights for Everyone—which was a coalition of fifteen different groups committed to gay rights. The protest rally occurred in Jackson Square and attracted roughly 3,000 people. In attendance were national figures such as Leonard Matlovich and Frank Kameny. After hearing a few rousing speeches, the crowd sang “We Shall Overcome” and began marching toward the site of the concert. Public support for the protest was overwhelming as evidenced by the cheering residents of the French Quarter who had adorned their iron balconies with flags and banners of support. Paper Monuments, Matt Phelan, artwork, and Frank Perez, narrative, “H.E.R.E. 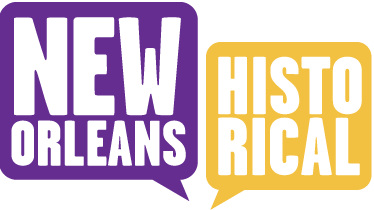 (Human Rights for Everyone) Activists Unite Against Anita Baker,” New Orleans Historical, accessed April 24, 2019, https://neworleanshistorical.org/items/show/1429.